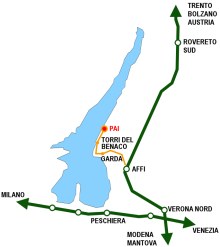 Situated in Varone, one of the small districts of Riva, the waterfall is three kilometers from the lake. Flowing from Lake Tenno into a gorge naturally formed by erosion over 20,000 years (at an average of 4 mm per year), the water thunderously plunges from a height of 87 m. Phone: 0464-521421. Free parking for buses and cars. water erosion over millions of years. It is not a powerful, crystalline waterfall or a dazzling and noisy mass of water: here the water penetrates the bowels of the earth and disperses, creating a whirling cloud of droplets that turns into a colorful kaleidoscope when hit by the sun rays. Flowing from Lake Tenno into a gorge naturally formed by erosion over 20,000 years (at an average of 4 mm per year), the water thunderously plunges from a height of 87 m.
“The water pours down with a deafening noise at the back of the deep, narrow chasm formed by paunchy, bare, slippery rocks that resemble huge fish bellies.” Thomas Mann remembered the Varone Waterfall many years later for the key scene of his novel, “The Magic Mountain.” The waterfall has always elicited emotions and sensations: inaugurated as an attraction by John, the King of Saxony, it later became an obligatory stop for crowned heads and literary minds. Franz Joseph, Umberto II of Savoia, Franz Kafka, and Gabriele D’Annunzio are just a few of the celebrities who visited this striking chasm, and this pilgrimage still continues today. 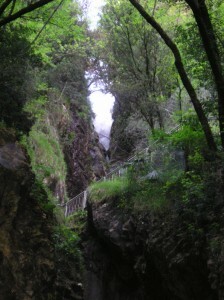 Just two kilometers from Riva del Garda, the Varone Waterfall can be easily reached by car or on foot. 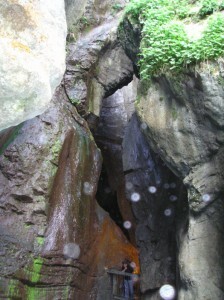 The waterfall is divided into two grottos that are open to the public: the lower grotto can be directly reached by way of the pebbly river bed. 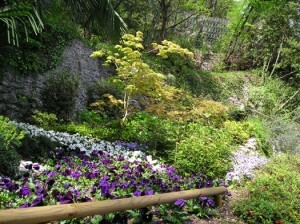 A walkway follows the curve of the rocks to the point in which the waterfall can be seen. The upper part can be visited by way of a convenient stairway nestled in the verdant surroundings. A small tunnel takes the visitor to a window that overlooks the chasm and affords a unique view. The sun rays at noon penetrate the cloud of water vapor, creating splendid rainbows. Thanks to the electric lighting, which was installed several years ago, we can admire the limestone formations on the grotto walls, a spectacle created by water with the talent of a sculptor.